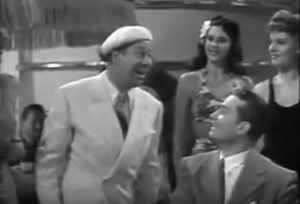 Skip Owens (Bert Lahr): Have you met Dolores? Tommy Dorsey: Yes, I’ve met Dolores. Skip Owens (Bert Lahr): she’s queen of the chorus. Merton Kibble (Red Skelton) You can have the chorus. Skip Owens (Bert Lahr): Have you met Olivia? Tommy Dorsey: Her I’d take, Olivia. Merton Kibble (Red Skelton) Throw her in the river-ya. Skip Owens (Bert Lahr): Who’s your queen, your rulah? Merton Kibble (Red Skelton) Tallulah! I would climb a hillah, I’ll paddle to Brasil-a. Skip Owens (Bert Lahr): But this is getting sillah. Merton Kibble (Red Skelton): ‘Cause I love her true-lah. Skip Owens (Bert Lahr): Who? Merton Kibble (Red Skelton) Tallulah. Skip Owens (Bert Lahr): When she starts out the conga, like an anaconda, it’s fricassee. Merton Kibble (Red Skelton): No one doing her hula can do what Tallulah can do to me.